A scene repeated at least four times over the Goodwin Sands as a stricken American B17 Flying Fortress attempts to reach safety. The fate of the possible remains of an unknown number of mariners and aircrew, lost in the southern Goodwin Sands off the coast of Kent, remain embroiled in a bitter modern battle which could yet be decided by a judicial review. At stake is not just the future of the archaeology of one of the most sensitive maritime archaeological sites in the world, but whether the methods of documentary research, survey and analysis deployed by major archaeological contractors and their regulators to determine commercial planning and licence applications are fit for purpose. At approximately 07.46 on the morning of 8 July 1944 Captain Kearie L Berry Jnr of the American 601st Bomb Squadron, 398th Bomb Group was nursing his crippled Boeing B17 Flying Fortress #42-107096, across the short stretch of water between Britain and France. 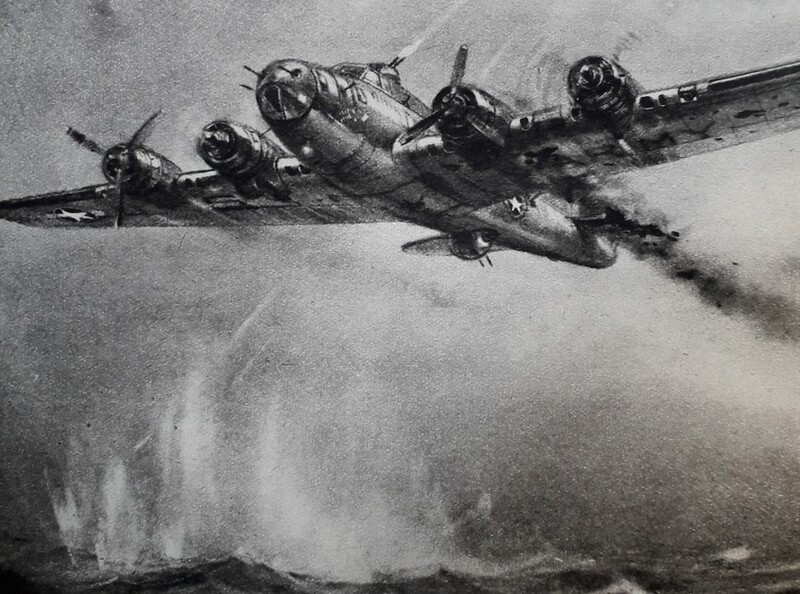 The giant four engined bomber had been badly hit by German anti-aircraft fire while attacking a Nazi “No Ball” V weapon site in Northern France and as Captain Berry and his co-pilot, 2nd Lieutenant Raymond Thornton, struggled to maintain height and control with two engines knocked out, Berry’s radio operator, Technical Sergeant Carlo Galioto, lay severely wounded in the flak shredded fuselage. Over Calais, just a few minutes flying time from the Kent coast and the potential refuge of RAF Manston with its emergency equipment and 9,000 ft (2,700 m) long, 750 ft (230 m) wide runway, Captain Berry lost his battle as the aircraft’s two remaining engines caught fire, and he ordered his crew to bail out into the frigid waters of the English Channel. After two hours of physically draining effort Captain Berry and his tail gunner, Sergeant Manuel C Ray, managed to get onto the relatively safe haven of the Goodwin Sands from where they were picked up eventually by an RAF Air Sea Rescue launch. However, the rest of Berry’s crew, Co-pilot Thornton, Navigator: First Lieutenant Walter Kruse, Bombardier: First Lieutenant Paul McCain, Flight engineer/top turret gunner: Staff Sgt Harry Bisping, Radio Operator: Technical Sgt Galioto, Right Waist Gunner Staff Sgt George Pappajohn, and Ball Turret gunner: Staff Sgt Ralph Hess, were killed. However, while the basic story of Captain Berry and the sacrifice of his his crew is easily available in the public domain after a few minutes work with a certain search engine, and the routine Missing Air Crew Report [MACR] was declassified in 1973, you will not find it mentioned in any of the hundreds of pages of data in submissions made by the consultants working on behalf the Port of Dover in its licence application to the Marine Management Organisation, requesting permission to remove up to three million tons of sand and gravel from the southern Goodwin Sands for the so called Dover Western Docks Revival Project. This is significant because another account Captain Berry left of his rescue offers other crucial details about the use to which the Goodwin Sands were put during World War Two. A use which could also have a significant impact on the safety of any dredging operation, but which again is largely absent from the detailed discussion in documentation submitted to the MMO. While awaiting the rescue launch Captain Berry reported that the sands were strafed by two allied Grummen Avenger bombers which were using a wrecked boat as a target. Indeed, wartime documents show that the Goodwin Sands were a designated Air To Ground Range [ATGR], meaning that there is a higher than average chance of finding unexploded ordnance of all types on the Sands. To opponents of the Port of Dover’s plan, such as the locally based Save Our Sands group, these apparent failures to properly quantify the potential for the southern Goodwin Sands containing the crash sites of identifiable aircraft like Captain Berry’s B17, and the ammunition and ordnance which threatened his survival, has led to searching questions being asked about the overall quality and fitness for purpose of the environmental impact assessments and marine geophysical surveys submitted by the Port of Dover, through its consultants Royal Haskoning DSV, which were used by the Marine Management Organisation in reaching its controversial decision to grant the Port of Dover its dredging licence. The alleged failure of the archaeological assessment process has been further highlighted by the publication of a video which appears to show the remains of a crashed aircraft, perhaps even an American B17 Flying Fortress like the aircraft flown by Captain Barry and his crew, in an area where the licence application identified only a seabed disturbance. The video, which was shot by East Kent diver Vincent Woolsgrove and made public by the Deal based campaign group Save Our Sands in September 2018, appears to show a number of aircraft parts, including distinctive radial engines and a three bladed propeller, lying on the sea bed. While the presence of the distinctive shape of the engines, with the cylinders arrayed in a circle around the propeller shaft, is not in itself indicative of the type of aircraft located the presence of four engines on what appears to be a single site could be significant. As many as four American B17 Flying fortress bombers, including Captain Berry’s aircraft, are missing in the area of the Goodwin Sands, and only one such crash site has been reported as being located previously. A three bladed propeller, belonging to an unknown aircraft,, photographed in the buffer zone of the dredging area on the south Goodwin Sands. The survey submitted as part of the licence application by the Port of Dover identified this target as unknown but of possible archaeological interest. The aircraft shown in Mr Woolsgrove’s video appears to be in addition to the aircraft known to be a B17 which was identified by the US based organisation Bent Prop, which searches for US service personnel who are listed as missing in action. And here it is necessary to add one last, potentially crucial, observation from the Missing Air Crew Report into the loss of Captain Berry’s aircraft. “The finding that one of the targets is a large aircraft and it was not identified during the survey puts the whole process into question. It is not as if the maritime heritage sector can make the excuse that this level of uncertainty is the unexpected consequence of an unprecedented project. However, it appears that, at least as far as the Goodwin Sands are concerned, the methodology employed to quantify the risk of encountering crashed aircraft, and indeed other types of marine archaeology, have fallen short. Neither can the MMO and Historic England complain that there are no real precedents for the identification and forensic recovery of the remains of missing aircrew from a crashed historic at sea. Indeed, at least one highly detailed case study of the issues surrounding the formation and nature of the crash site of a shot down aircraft and the forensic recovery and identification of human remains from a crashed aircraft underwater has been published in detail in a scientific journal and can be held up as an example of a potential methodology representing best practice. On 13 June 1952 the twin engine Royal Swedish Air Force Douglas Dakota “Hugin” was shot down into the Baltic Sea, in international waters, by a Russian Mig 15 fighter. Hugin had been on a Top Secret signals intelligence [SIGINT] gathering mission, eavesdropping on Russian radio and radar transmissions from the then occupied Baltic States. The crash site of the lost aircraft was never identified and her crew of eight military and civilian personnel were posted as missing presumed dead, casualties of one of the many hot incidents of the, so called, Cold War. However, on 10 June 2003 the resting place of Hugin and her crew was identified by Deep Sea Productions which was undertaking a search for the missing aircraft. With the location of the wreck now identified the decision was taken by the Swedish authorities to recover the aircraft and the remains of her crew. An operation which was completed successfully over a number of months in 2003 and 2004. The heavily damaged, but still recognisable, wreckage of the Hugin was recovered and the award winning exhibition about the loss of the aircraft, Acts of Secrecy – DC-3 that disappeared, now forms a core exhibit in the Swedish Air Force Museum, Linköping. In the course of the recovery of the aircraft the Swedish Commission for Disaster Victim Identification undertook a full forensic analysis of the human remains found in an attempt to identify the remains of Hugin’s missing crew members. These comments are critical towards understanding the potential for finding human remains associated with crashed aircraft, because, as the Swedish report makes clear, the remains of missing aircrew need not even be closely associated with a wrecked aircraft let alone inside it, but may instead be found hundreds of meters away in the surrounding seabed. However, as the Swedish experience shows, such remains can still be recovered and identified forensically, in a properly designed survey and recovery, even if they are indeed located several hundred meters away form the principle focus of the crash site. However, in spite of these difficulties, in the course of an operation which ran from late October 2003 to mid June 2004, the Swedish team were able to recover, and the subsequent forensic research was able to identify positively, remains belonging to four of Hugin’s crew of eight. Nonetheless, although this methodology for the forensic examination of an underwater aircraft crash site has been described in detail, proven in the field and published as Open Access documents in English, this case too is not mentioned in any of the various impact assessments submitted for the Goodwin Sands application, and the methodologies used by the Swedes are not even discussed, let alone recommended, in relation to the application, in spite of the acknowledged high probability of encountering crashed aircraft and potentially human remains. “Anomalies may exist in the eastern half on the licence area but were not detected by the geophysical survey as they are buried. Of course Mr Woolsgrove’s the video released by Save Our Sands suggests that, far from being unidentified because they are buried, at least some anomalies might be the identifiable remains of aircraft and indeed previously unidentified historic vessels. “The methodology for these mitigation measures has been set out in a draft archaeological Written Scheme of Investigation (WSI) to be agreed by DHB with Historic England and the MMO prior to the commencement of dredging. These measures will reduce the residual impacts of the proposed dredging works to “minor significant adverse”. However, the draft Written Scheme of Investigation referred to by the Port of Dover was not included in the tranche of documents made available to the public during the final consultation phase of the licence application. This had the result that it was impossible for independent experts to peer review, and potentially find shortcomings in, the proposed mitigation plan prior to the licence being granted, as would be expected normally. In short, the wider archaeological and heritage community was expected to take on trust that the proposals included in the WSI would be a properly designed expression of the most appropriate available techniques, developed in full understanding of the range of maritime and aviation wreck sites likely to be encountered in the south Goodwin Sands dredge zone. However, critics of the dredging plan argue that the shambolic nature of the Port of Dover’s response to the possibility of their dredger destroying sites protected by the Protection of Military Remains Act means that trusting the licencee and its consultants to “do the right thing” by the archaeology, without peer reviewed documentary proof would be, at best, naive. The reasons for this break down of trust are clear. The critics point to the fact that from the outset of the Goodwin Sands licence process the Port of Dover’s environmental consultant, Royal HaskoningDHV, appears to have failed utterly to understand the implications of the likely presence of aircraft crash sites for the dredging project, most, if not all, protected under the UK Protection of Military Remains Act which makes the unlicensed disturbance of a crashed military aircraft of any nation within UK jurisdiction a criminal offence. Indeed, as thePipeLine reported previously, Royal Haskoning appeared initially to have been so ignorant of these issues that in their public interactions they confused the roles of the Commonwealth War Graves Commission [CWGC], whose responsibility relates only to war graves on land, and the Ministry of Defence Joint Casualty and Compassionate Center [JCCC] which actually administers the recovery of historic military casualties in the UK under the Protection of Military Remains Act. The Commonwealth War Graves Commission listed as a consultee by the Port of Dover/Royal HaskoningDHV in a slide used in a public presentation. The CWGC has no statutory role in recovering missing military personnel. Indeed, Royal Haskoning and the Port of Dover only addressed the issues raised by the Act with JCCC and other bodies when the Save Our Sands protest campaign exposed the shortcomings of their work. In so doing they also exposed a fundamental failing in the current marine licencing system. By treating the decision making process as a transactional trading off of archaeology and ecology against costs to the project under application, the Marine Management Organisation ignores the matter of public perception. This has the effect that, while the destruction of previously unrecorded archaeological material might be seen bad enough by heritage specialists, but ultimately accepted as economically acceptable collateral damage; the situation which pertains in development archaeology on land; the same does not apply to the issue of human remains and particularly to the remains of missing military personnel such as the dozens of aircrew believed to be missing in the area of the Goodwin Sands. Time and again in recent years news of the desecration by commercial salvage companies of the maritime military graves of sailors lost on warships, such as the looting of HMS Queen Mary in the North Sea and HMS Exeter in the Java Sea , for private profit, has been met by widespread negative media coverage, the naming and shaming of the alleged perpetrators, public anger and questions to ministers in Parliament. Add to this the experience of the Swedish forensic team which demonstrated that human remains can still be identified even when fragmentary and found some distance from the aircraft they are associated with, as long as the association can be maintained by a controlled forensic recovery and, critics argue, the position of the Port of Dover in making the dredging application and the Marine Management Organisation in agreeing to licence it, becomes morally untenable. Such a permission also represents a political risk and a clear route to corporate self harm on the part of the Port of Dover, not to mention to the organisations such as the MMO and Historic England which could be perceived to have colluded or condoned in the disrespectful and destructive activity. Meanwhile, the argument about the efficacy of the safeguards put in place currently by the MMO and Historic England can be reduced to a simple question. Even if it is judged morally acceptable for the dredging of such a sensitive area to go ahead, what are the chances that a single spotter on board the dredger might identify human remains among the tons of material entering the dredger’s hopper, by which time the chance of any forensic association with a crashed aircraft would almost certainly have been lost irretrievably anyway? thePipeLine cannot answer the question as to how this situation came about in the application process for the Goodwins Sands dredging licence. That said, it is worth stating that the archaeology of aviation is still a relatively young discipline with very few people worldwide counting themselves as specialists aviation archaeologists and fewer still of those experts work within the UK based archaeological units which act as consultants in planning applications. There is a further issue which can be argued to have led to the current level of mistrust regarding the capabilities and motives of the various archaeological consultants and regulators involved in the Goodwin Sands process.goes to the heart of the conduct of an academic archaeological process. It is the case that, while the ethical treatment of human remains is central to the conduct of modern professional archaeology, such remains are regarded in neutral terms as part of the “archaeological potential” of a site in any project planning. Generally the personalisation of those remains only comes in the post excavation phase of most projects, when an array of processes and experts are able to add form, medical history, and even with the application of DNA and strontium analysis, hair and eye colour and a likely place of origin. Perhaps the most famous recent case of such detailed research capturing the public imagination is the recovery and identification of the remains of King Richard III in Leicester. Thanks to such powerful scientific tools archaeologists are able to point increasingly to family relationships and, in specialised cases such as the identification of burial where unit muster rolls, war diaries, descriptions in pay books and even family and professional photographs are available, detailed forensic analysis can even restore a name to the missing and a relative to a family which might still be remembering and grieving a loss after three generations and perhaps more. For example the Plug Street Project, working with the Australian Government, identified the remains of Australian soldier Pvt Alan Mather who was killed at the Battle of Messine in 1917. In this context the routine application of academic anonymity to human remains, which can be reasonably conjectured to be present in a development site, is contrary to the public’s perception of the remains of missing service personnel which is that, even when unidentified remains demand the respect and protection by the states party they served and by the jurisdiction they are found in. As described above, this situation is recognised in the UK’s Protection of Military Remains Act which makes it an offence to disturb a crashed aircraft without a licence obtained in advance. It is also worth noting that the Ministry of Defence states that such licences are normally refused if human remains and/or unexploded ordnance are thought to be present. Cases which apply to many of the aircraft missing in the Goodwin Sands area. The concept of a “War Grave” is now also central to the popular culture of remembrance in the UK. Indeed, even when there is no such thing at sea as a “war grave” protected under International Law, the angry response of relatives, members of the public and politicians to the media coverage of incidents such as the illicit commercial salvage of the battlecruiser HMS Queen Mary by Dutch company Friendship Offshore, suggests that, even at a hundred years remove, the idea of exploiting such a “grave” for purely commercial profit is unacceptable to a broad swathe of public and political opinion. However, this assignment of individuality to the missing before they are identified in a post excavation or recovery process has yet to become a given in the assessment of development sites which might include multiple sets of human remains such as the Goodwin Sands and seen from the would be developers point of view it is easy to see why. In the first instance the assignment of identities to persons known to be missing in the area of a particular development site might be seen as contrary to the apparent objectivity of the assessment process. However, there is another possible reason why archaeological consultants acting for a developer and a regulator adjudicating on such an application might not want to research, let alone publish the potential identities of the missing. It is becoming apparent from cases such as the Goodwin Sands dredging licence, that once such personalisation of the missing is in the public domain, as that for the south Goodwin Sands now is thanks to the work of the Save Our Sands campaign and its expert advisers such as the Kent Battle of Britain Museum at Hawkinge, such publication devolves and disperse the cultural, as opposed to the physical and legal, ownership of the site. This changed relationship on the part of the wider public can create a substantial additional obstacle to a project finding acceptance. Something the Port of Dover has found out to its cost, in both public relations terms and literally in delays to their project and additional work the company has been required to commission. This is not a triumph of sentimentality over academic rigor. As has been demonstrated in the case of the crew of the Hugin, and in many other cases on land and sea, the identification of the missing depends on detailed forensic investigations at a documentary and physical level undertaken by skilled multidisciplinary teams. In the case of the south Goodwin Sands application, while a bland reference to the possibility of crashed aircraft being present makes it easier to discuss the issue in terms of equally sanitised probabilities, and mitigation strategies, that discussion would have been substantially more difficult if the impact assessments had stated that one of the aircraft which might be present in the dredging area, and which might be destroyed by the dredging, is the Hurricane fighter which was flown by nineteen year old Pilot Officer Keith Gillman of 32 Squadron, when he was reported missing over the English Channel off Dover on 25 August 1940. Days after his death Keith Gillman, who actually came from Dover, would become an enduring icon of the Battle of Britain when a photograph of the young pilot looking up into the sky appeared on the cover of Picture Post magazine. Dover born Pilot Officer Keith Gillman, seen here in the iconic photograph which appeared just days after his death in the Battle of Britain, is one of the dozens of wartime aircrew missing in the area of the Goodwin Sands. Add to the potential of Keith Gillman’s remains being present in the dredge area the possibility that the remains of the named members of Captain Berry’s B17 crew, and dozens of other named missing aircrew might also be present and it is possible to suggest that obtaining permission for a destructive process such as dredging would become, at the very least, even more difficult for the Port of Dover. However, critics of the application of regulation to development sites at sea and on land, argue that conscious and unconscious biases built into that system mitigate against such controversial details being introduced to a process which is designed by the UK Government to be permissive of sustainable development. It is suggested that there may be another more insidious reason for the apparent reluctance to address in detail the implications of dredging for the remains of missing aircrew, and it is an allegation which goes to the heart of the conduct of modern developer funded, commercial archaeology of the kind producing Archaeological Impact Assessments for development projects on land and at sea. Speaking under conditions of anonymity, a number of archaeologists who have worked in the commercial sector, who have been consulted by thePipeLine, suggested that, alongside pressures of time, which can make it difficult to carry out research in anything other than previously known, or otherwise easily available, sources, there can be an unspoken pressure on archaeologists acting on behalf of commercial clients, or adjudicating on high value commercial projects, not to find archaeological “issues” which might complicate a development project, or to suggest lines of archaeologically appropriate, but potentially time consuming and expensive, fieldwork in mitigation of certain damage or loss. This pressure can be particularly strong if such an an archaeological issue might be seen as a potential project killer, as is certainly the case with the issue of military remains and Goodwin Sands dredging licence. Everyone agrees the south Goodwin Sands are highly sensitive both environmentally and archaeologically and on the evidence, even the arguably flawed evidence as presented, the decision whether or not to grant the licence to dredge was not seen by the independent archaeological bodies and experts as a narrow judgement call which could have gone either way. However, it is alleged that one symptom of the tendency, consciously of sub-consciously, to play down the complexity and sensitivity of archaeology is the use of in-house staff, who might not be experts, to author and edit reports, rather than outside consultants who are subject experts, but who have to be paid fees and are not as easily controlled if the project manager, or a clients own consultant, requests certain conclusions or recommendations are toned down, or even removed entirely. Certainly, in the case of the Goodwin Sands application, while there is no suggestion of any attempt to willfully mislead the officers of the MMO on the part of any of the organisations submitting reports on behalf of the Port of Dover application, it does appear that certain basic documentary and field research was not undertaken as comprehensively as it could, and arguably should, have been. This had the result that a detailed understanding and exposition of the archaeological potential of the targets identified in the various surveys and forensic requirements of aircraft crash sites, seems to be utterly missing from the documents upon which the Marine Management Organisation based its finding that the issuing of the dredging licence for one of the most archaeologically and environmentally sensitive parts of the UK coast. It is also the case that even if the background research was done, but the evidence was not placed in the published documents, then anyone attempting to critique the submission was forced to do so from a position of severe disadvantage. It can be argued that this perceived disadvantage extends to the officers of the Marine Management Organisation who were actually taking the decision whether or not to grant the licence based on what was, at best, incomplete information. This situation becomes yet more one sided, perhaps to the point of appearing egregious, when the final draft Written Scheme of Investigation, which archaeological ethics and natural justice demand, must be based on a best understanding of all the evidence available, is not offered up also for public peer review as part of the licencing process. After all, the essence of a draft of any document is that it can be changed in the light of new information, or a better understanding of the process, from whatever source that better understanding comes. In short, the simple truth missing from all the documents submitted to the MMO and provided to the public during the three consultations over the Goodwin Sands dredging licence, is that if a wrecked aircraft is identified in the Goodwin Sands dredge zone, precedent suggests that, to be effective, the preferred method of protection, an exclusion zone, must be based on detailed underwater observation by divers and ROV’s obtained on a time consuming case by case basis, and each exclusion zone might have to extend over many hundreds of meters and could even intersect with other exclusion zones. Alternatively, if the decision is taken to remove an aircraft to allow the dredger to work, that investigation and recovery could require a painstaking forensic effort lasting months and potentially costing into the millions per aircraft encountered [and that is before we begin to consider any other archaeology which might be identified, such as predominantly wooden shipwrecks which would not show up on geophysical surveys. Of course the question then arises whether the Port of Dover’s dredging plan would even remain viable with these level of mitigation in place, and with it the possibilities for extended delays to the project and spiraling, but indeterminate, costs. “We were made aware in late August of materials the group identified near the proposed dredge site. “Having reviewed the information we noted these features were outside the dredge area – both the original area proposed by Dover Harbour Board and the one later revised to avoid anomalies identified to the west. It also appears that the features referenced were identified as anomalies in the surveys used to inform the marine licence application. “We believe it was appropriate to grant the licence because we were satisfied that sufficient mitigation measures are included in the marine licence. This is on the basis of evidence provided, which has demonstrated there are no definite features of archaeological interest in the licensed dredge area that are not protected, and on advice from our advisers. Concluding our discussion with Historic England, thePipeLine cited the case of the the Swedish Air Force DC3 aircraft Hugin, where remains of crew members were recovered as much as six hundred meters from the main focus of debris and we asked why this case, which is well known in aviation archaeology circles, which is the subject of a major museum exhibition and which has been fully published in English in an open access article in a Journal of Record, was not cited in the case of the Goodwin Sands and in particular in the setting of the size of exclusion zones? It is now clear that when Doug Bannister, the new chief executive of the Port of Dover, takes up his post on 1 March  he will face a number of dilemmas. Not least the possibility that a “No Deal” Brexit will turn the port [and much of the road network of East Kent] into a giant lorry park. However, also on his “to do” list is to make the final decision whether to trust the outcome of the licencing process and execute the south Goodwin Sands dredging licence with all the potential for delays, spiraling costs and reputational damage the licence represents if the Royal HaskoningDHV, and Historic England are found to have underestimated the archaeological risks; or instead to play safe and continue to obtain the aggregates required for the Dover Western Docks revival project from the existing, less contentious sources in the southern North Sea, which the project has used until now. Of course, the decision may be taken away from Mr Bannister by the grant of a Judicial Review sought by the Save Our Sands campaigners. However, thePipeLine understands that the Marine Management Organisation and the Port of Dover are opposing the application for Judicial Review vigorously. If the two bodies are successful in warding off the challenge from Save Our Sands then the only defence remaining to the servicemen and crashed aircraft of two World Wars, and at least four nations, not to mention ten thousand years of maritime history in the English Channel, are the methods of archaeological analysis and prediction which, the Save Our Sands campaign and its independent expert witnesses argue, have so far been found not just to be wanting, but to be utterly inadequate and not fit for such an important and sensitive purpose. A danger which is especially acute when sites under threat, and the remains they might contain are of people who are identifiable, whose lives and sacrifice are remembered with respect, and who may have, in many cases, living relatives. NB: Article updated at 18.10 on 02/02/2019 and 19.24, on 03/02/2019 to take account of fresh information about the loss of Captain Berry’s B17 from the USAAF Missing Air Crew Report [thanks to historian Mark Khan].